What doesn't kill you makes your garden grow stronger. 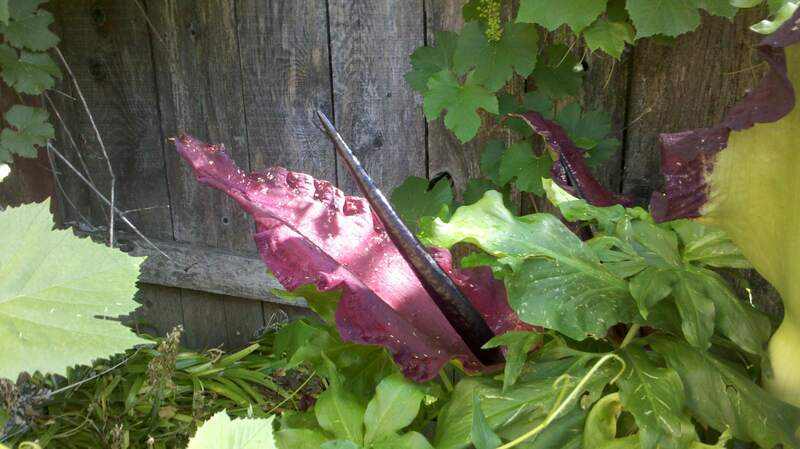 A reader of Rotten Botany gracioulsy sent me pictures of this gorgeous Dead Horse Arum that came up in the garden of her home in the Sierra Foothills in spite of a heavy snowfall this winter. As she wrote to me, it is located in the back corner of the garden so its scent isn’t too permeating. I agree with the owner that this is a Dead Horse Arum. 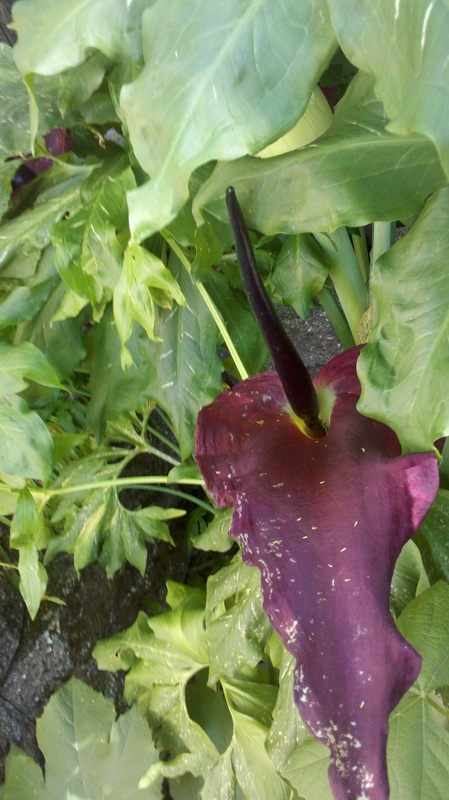 The Arum Konjac or Devil’s Tongue has a red stamen, and the Voodoo Lily has a moddled stem. The Vampire Lily seems to have more of a ruffled edge to the flower but it does look similar to this. They are all members of the same Araceae family. mmmm..ARUMS! Thanks, Mary A. for this amazing pictures. I have to admit, I am super jealous. I’ve always dreamed of moving into an overgrown garden with hidden creepers and fetid florals lurking beneath the ivy. Who planted this arum there? It was no accident. Read more about the Dead Horse Arum on Rotten Botany HERE. And if you have pictures of any unsusal plants growing let me know! A sweet and rampantly blooming annual that frequently reseeds itself, this delightful hybrid of the California Native Baby Blue Eyes (of the same botanical name, Nemophilia menziesii) is a must-grow for the pirate’s garden. Little cup-like, black and white flowers. 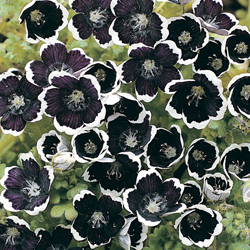 This little lovely looks amazing in containers, hanging baskets, or as a gothically-minded border plant. It grows about 8” wide by up to 12” across and thrives in all USDA zones as a spring and summer bloomer. Sunset zones 1-24. Likes sun to part sun. A word of caution for those of you in coastal climates where the summer means fog: this plant is prone to powdery mildew and should go in the sunniest possible place in your garden. Hotter inland gardeners can place it in the more dappled light of their sunnier shade beds. Bay Area gardeners: Look for the plants at Annie’s Annuals in the early Spring through Summer or check out Sloat Garden Center. I believe the seeds are available through Botanical Interests, but you need to start them in March or so to get a summer bloomer. If you’ve had luck with these beauties or know where readers can pick them up feel free to comment and let us know! Among the lush greens and vibrant reds of the tropical forest lurks one of the most unusual plants of the world: Tacca chantrieri, or The Bat Plant. 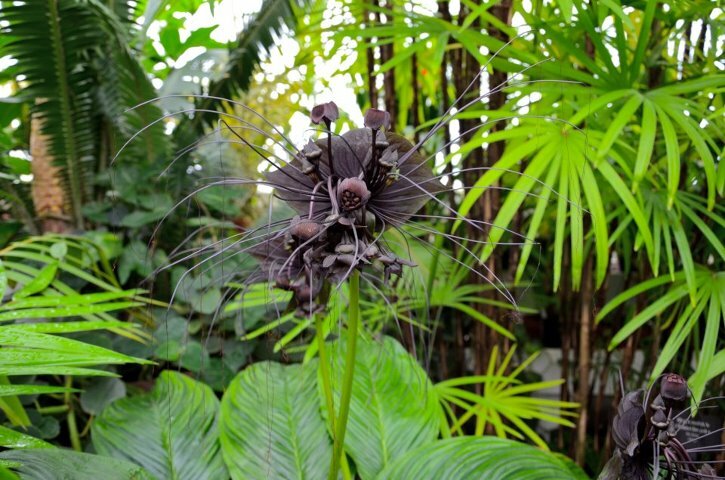 Named for its black bat-like flower that grow up to 12 inches across, The Bat Plant could also be nicknamed The Black Cat Plant for its distinctive long “whiskers” that can grow over 2 ft. long. Other common names include The Devil Flower, Bat-Head Lily, and Black Tacca. In other words they have isolated something as effective and powerful as Taxol in the beautiful bewitching bat plant. Go rotanical, go! Want to grow your own super-freak? If you live in a steamy, humid climate you should have no problem. You can just let it go wild. But for the rest of us, even in my mild SF garden, you’ll need to do it in a pot in a greenhouse most of the year. If it gets below 40 degrees they get very, very cranky. Shade or bright indirect light. Why would a bat like the sun? Height: About 18-20” with flowers of several inches. Remember the whiskers, though, which can dangle down to the ground! Note: this amazing photo came from my cousin Anne Mackin who snapped it at the SF Conservatory of Flowers. They have a regularly blooming Bat Plant!! In the spirit of skullduggery, here are a few photos from my trip to Mexico during the celebration of Dia de los Muertos, or Day of the Dead. A celebration at the end of October/beginning of November that culminates in the Noche de Muertos, or Night of the Dead from midnight on November 1st to midnight on November 2nd. The weeks and days leading up to the holidays are filled with sugar skulls and treats and all night “pop-up” flower markets. Although the time when the dead pass into the graveyard is a somber and silent occasion, the nights and hours before and after are full of revelry: drinking, building floral displays, and remembering. Entire families camp out in the graveyards and work together to honor their beloved departed. November 1st is typically a night to honor children and those who are lost souls. The following evening is in honor of all the dead, and it is believed especially powerful to make offerings to anyone who has passed on in the last year. Special breads are baked and tied to the headstones and flower arrangements, meals are laid out and altars are everywhere. It is magical and mystical. Here are a few pictures that show some of the floral extravaganza. We visited the state of Michoacán, Mexico. Much of the time we spent was in Patzcuaro. A new species of Amorphophallus has recently been discovered !!! It isn’t quite as big as The Corpse Plant (A. titanum)but seems to be just as wretched in scent. Amorphophallus perrieri possesses the unique adaptation of releasing a smell like death to attract pollinators like carrion beetles and flies just as its cousins the Corpse Plant and the Devil’s Tongue (A. konjac). Growing some five feet big this thing could stink up the whole island of Madagascar where it was discovered. Apparently the botanist, Greg Walhert, was looking for violets when he happened upon this horror! What an amazing find. Wahlert and his lab partner are affectionately referring to it as a Porta Potty Flower. Clearly this is a true rotanical deluxe. New “Porta Potty” Flower Discovered. Salvias are one of the more amazing plants. There are dozens of varieties, all of which have different color blooms: red, white, turquoise, purple, chartreuse. 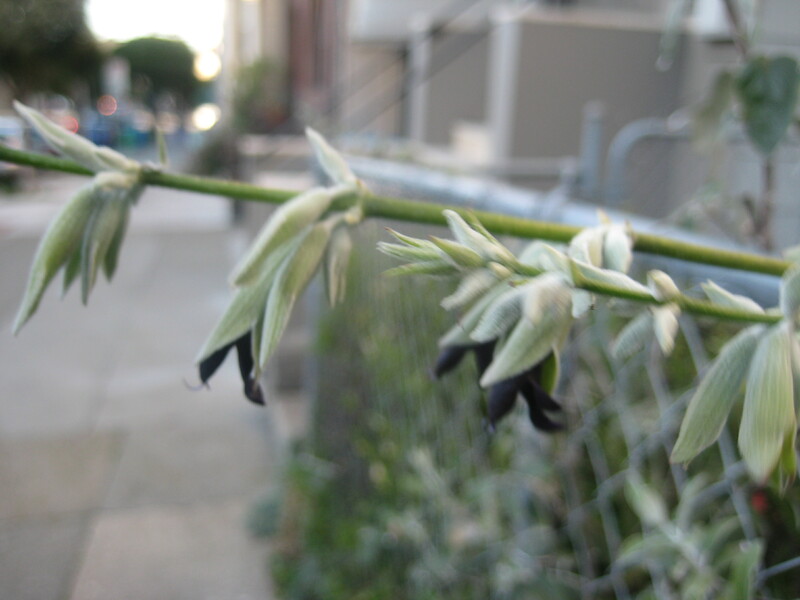 But nothing could be cooler than the salvia that blooms black. That’s right! 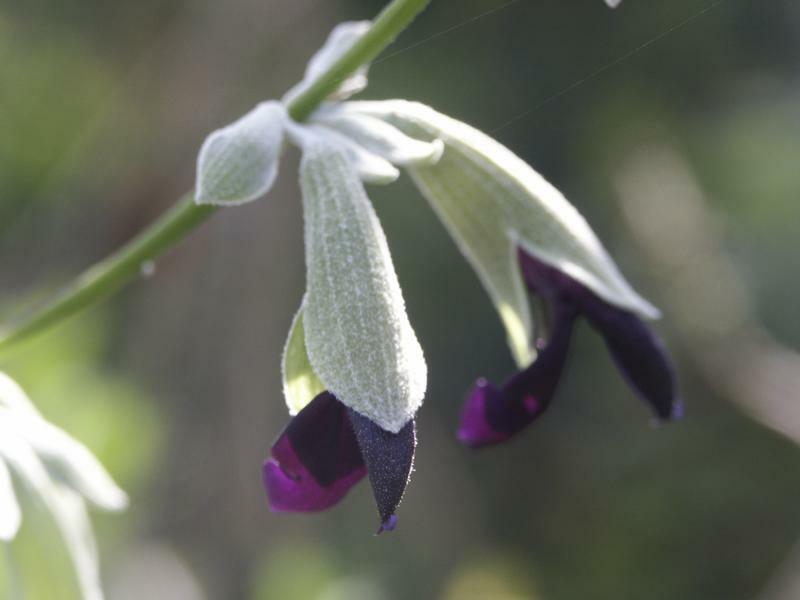 There is a BLACK BLOOMING SALVIA which has earned the name Salvia discolor. A tender perennial, Salvia discolor thrives in the local Bay Area climate but being a native to Peru it can manage in a variety of climates and winters over nicely with the proper mulching. The leaves are mossy green and the stems brilliantly silver, contrasting with the deep purpled blackness of the blooms. It has a pleasant acrid smell, not unlike your common household sage. The leaves do have a sticky quality, which earns it the nick name “fly paper sage”. 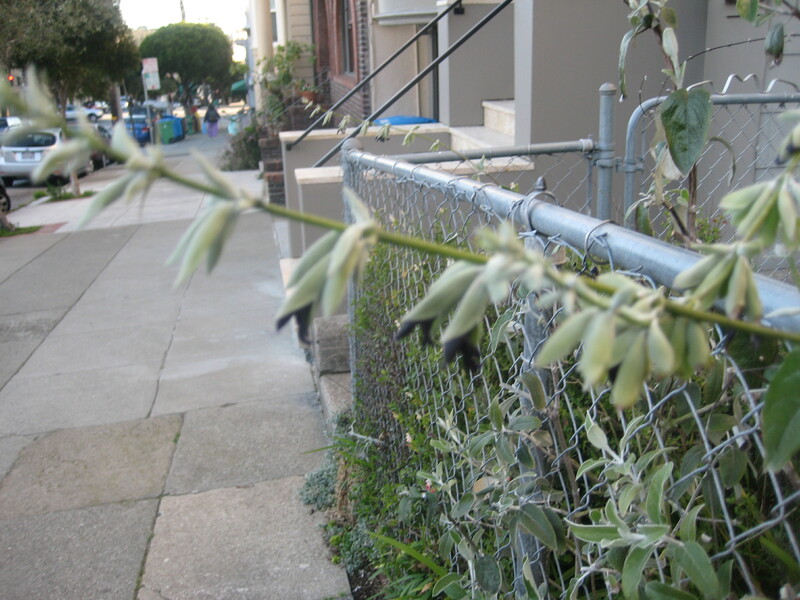 I had been an admirer of this unusual salvia for its ability to surprise even the most seasoned gardener with its striking flowers and was riding home on the N Judah one evening, proudly bearing my newest 4″ S. discolor which I had purchased just that afternoon via special order at The Scarlet Sage. The Scarlet Sage is San Francisco’s only herbal apothecary with decided witchy undertones and one of my all time favorite shops. In the spring you can count on them to have a fine selection of medicinal and edible plants, and they kindly special ordered my discolor. A woman sitting in front of me asked me what the plant was and what it was for and I had to admit I only knew the botanical basics. As far as I knew it wasn’t used in cooking or medicine, its value being in its unusual colored flowers. Just then a slight woman sitting next to her piped up. Like Salvia discolor, this woman was a Peruvian native and gladly informed me that this plant is used in Peru much like we use the common sage in cooking–beans, meats, stews. (Thank you public transit for the ethnobotanical opportunity!) The stickiness and pungent smell suggests that there is even more to this plant than meets the eye–so if anyone out there knows more about its medicinal properties let us know! Many sages are used to treat mild stomach upset and aid digestion. Like all sages, Salvia discolor attracts pollinators to your garden–bees, butterflies, small birds–so it is an invaluable asset. Plus it looks really freaking cool, its wild and wiry spindles of silver and black writhing up from the shrubbiness of its green leaves. Even though it is a bit sticky, it looks great in floral arrangements too, especially with white roses. Another true rotanical!! It is also drought resistant and needs little care once established! A bonus for those of us who tend to gardens that thrive on neglect. Below is a photo from the flickr commons. I will upload more pictures of my own discolor in the coming weeks. In addition there is a wild and wooly garden near my house with an abundant S. discolor just begging to be featured on Rotten Botany! Salvia discolor photo by Scott Zona, taken from flickr commons. Grows from 1 to 3 ft high and wide. Water regularly to establish and then infrequently. Likes full sun unless in an extremely dry and hot climate, then give partial shade. Hardy to 10 degrees though I would advise mulching with straw or something similar if you are in an area of heavy snow. Sometimes called the Devil’s Tongue and also referred to as the Voodoo Lily (but an entirely different species from the Voodoo Lily featured here) this beautiful specimen was caught blooming and befouling the entire Lowland Tropics gallery at the Conservatory of Flowers this weekend! And I count myself among the lucky few who got to “enjoy” this disgusting delight of the rottenest botanist variety. Apparently this Jello-like substance is used as a vegan substitute for gelatin and is made into the popular Asian fruit jelly snack, Lychee cups. (Adults have been known to choke on these too.) In fact, a quick google search will lead you to a number of products that feature konjac. Fiber-rich vitamin supplements are made from the tuber, and thought to promote healthy digestion and weight loss. The tuber is used in soups and stews, and you can even buy konjac flour. However parts of the plant are known to be poisonous. O’ the wonders never cease! 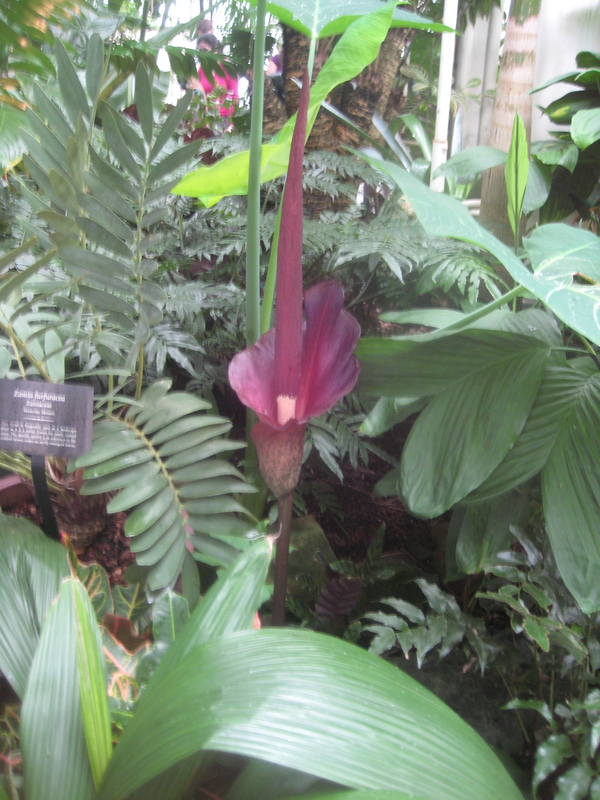 This particular Amorphohallus blooms about once a year, though it can skip a year or two, and must be kept in the tropical hothouse temperatures of the conservatory’s greenhouse or steamy main gallery. How best to describe the smell? Acrid, cloying–like the body of a roadkill animal left in the noonday sun. A touch sulfuric. This is the kind of smell you can’t quite place but you know you have smelled it before. It is the smell of decay. It reminded me most of the smell when you have left flowers in a vase too long and you finally decide to toss them, thus disturbing the putrid water that has been writhing with bacteria for a week or more. You dump it out and are aghast at the end result of what was a gorgeous, cheerful bouquet. The Amorphohallus konjac is a true rotanical!!! 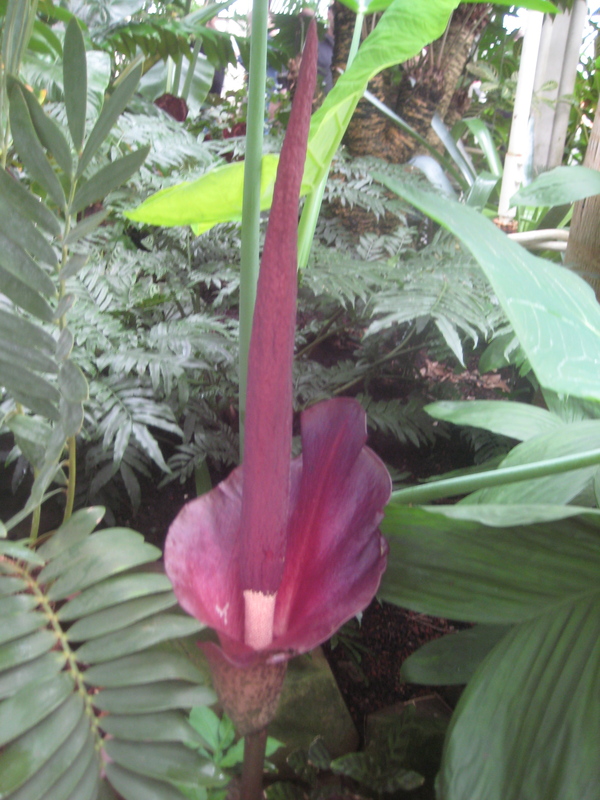 I would guess this plant is about two feet tall, from stem to the very top of its spadix, which sticks out considerably from its beautiful spathe. It is an incredible burgundy color, very velvety. If you dare get up close enough to examine it! It is tricky to see from the pictures but there is a sign to the left which will give you a bit of perspective. I tried to make my son stand next to it but he wasn’t having it!! Hardiness: To about 10 degrees. Plant in shade in sunnier climates, prefers more sun in foggier or cooler climates. Keep outdoors when blooming if you don’t want you house to smell like a toilet. A quick note to let you know that the Conservatory of Flowers in San Francisco currently has a blooming stinky amophophallus. I am not sure what variety, but it does not appear to be a titan arum. There are more than 150 plants known as amorphohallus so I will report back on the exact kind when I return, and I will post pics too! It’s a rare, er, treat to see and smell one of these fantastic and foul beauties. They only bloom for a few days at most so you have a pretty brief window. And some species go for years in between blooms. There is nothing quite as creepy as a sprawling planting of Black Mondo Grass. It looks like a lawn of spider legs, undulating from the earth, dark as night. This is not the kind of lawn you hide Easter Eggs in. This is the Devil’s carpet! 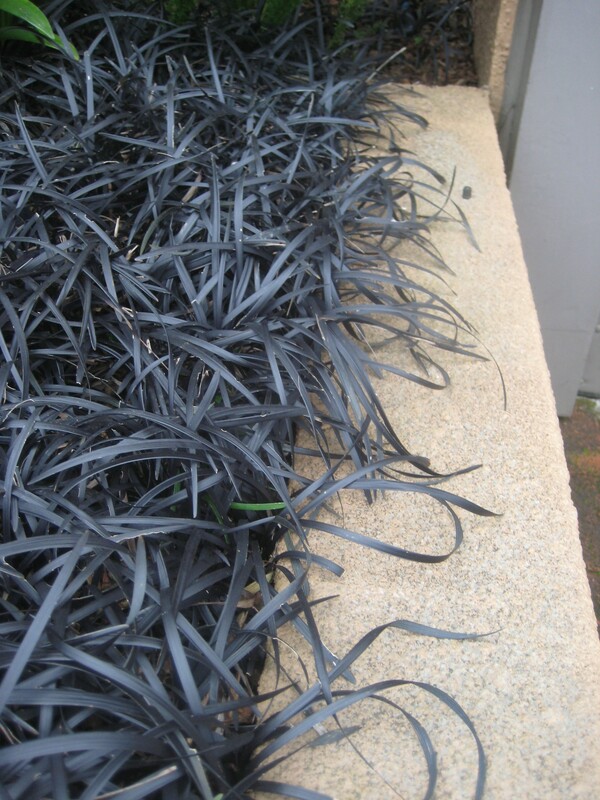 Sometimes also called Black Lily Turf or Black Dragon Grass this extremely hardy plant is, to my knowledge, the ONLY truly black plant on earth. Most flowers and petals or leaves of “black” plants are deep maroon or purple when held to a spot of sunlight. Not so the Black Mondo! No light penetrates this beautiful blade. For the average climate Black Mondo Grass does well planted in a shade or partial shade setting. In San Francisco’s foggy but consistent climate this does fine as a sun plant, providing the exposure is primarily morning sun. A north or northeastern facing place is excellent. With a bit more sunlight the blades get wider and the fairly slow-growing Black Mondo thrives. A lot of botanical sites say that this plant can take full sun but I would caution you not to put it into blazing afternoon sun unless you want Black Mondo to become Brown Mondo. It does get small flowers that give way to a beautiful blue-black fruit. This is pretty small, though, and not all that showy but another cool feature of an already insanely cool plant. This is an excellent planting for small spaces and container. To emphasize its spidery qualities, plant it in a container edge so it looks like it is crawling over! My friend Bill Barnett at Sloat Garden Center taught me to “Plant the Black Mondo in a cobalt blue pot with Chartreuse Selaginella” for maximum contrast! About 8″ wide by 12″ wide at its maximum. 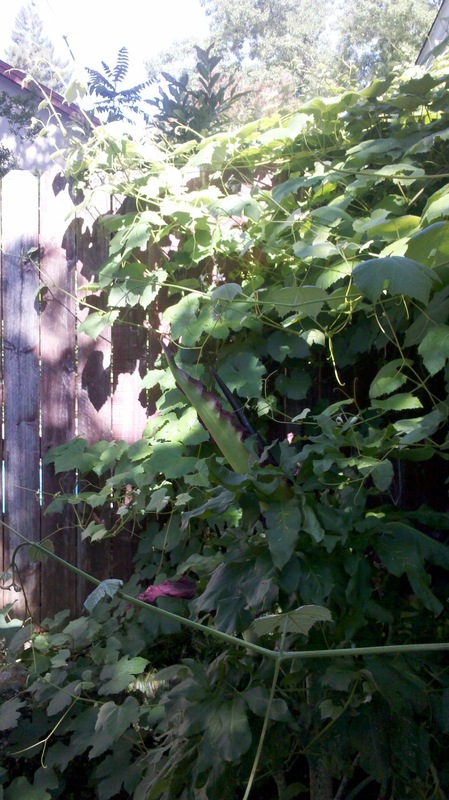 This is a clumping plant that won’t spread or take over your garden. It grows fairly slowly. This is a native to Japan. There are a couple of varieties, including ‘Black Beard’ which has wider blades and grows a little faster. The Lovely Lilies of Death! 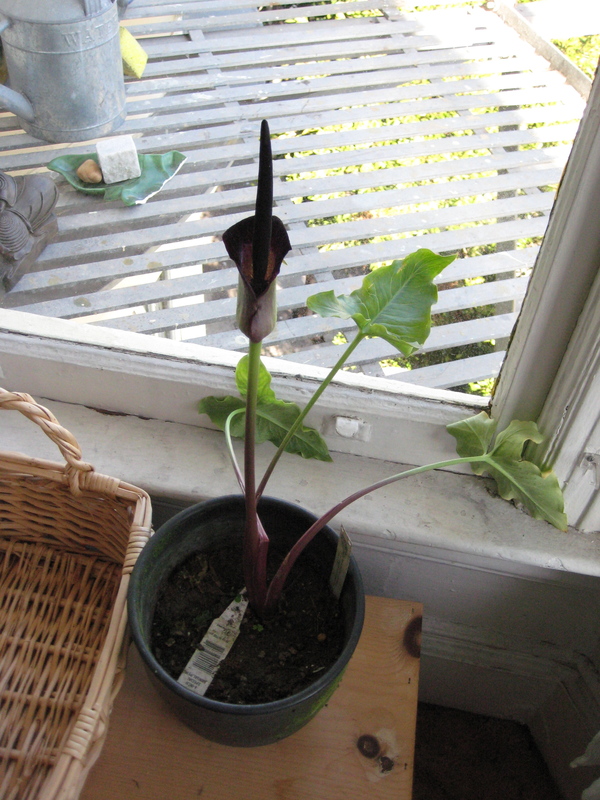 Who knew you could grow such novelties as Black Callas, Vampire Liles, Voodoo Liles, and more? The Rotten Botanist, that’s who! This week, Rotten Botany is “dead”icated to some of my all time favorite flowers–what I call the lovely lilies of death. Today, we begin with The Black Calla. You know those classic funereal flowers so often draped across a coffin or propped up in the corner of the parlor room during a wake? They are white with a yellow spike in the center, and if you grew up in the San Francisco Bay Area they very likely grew in your back yard. That would be the classic white Calla Lily, Zantedeschia aethiopica. The Black Calla Lily, Arum palaestinum, is not a true Calla Lily though they are both members of the same greater family, Araceae. The Black Calla’s spathe is terribly special! 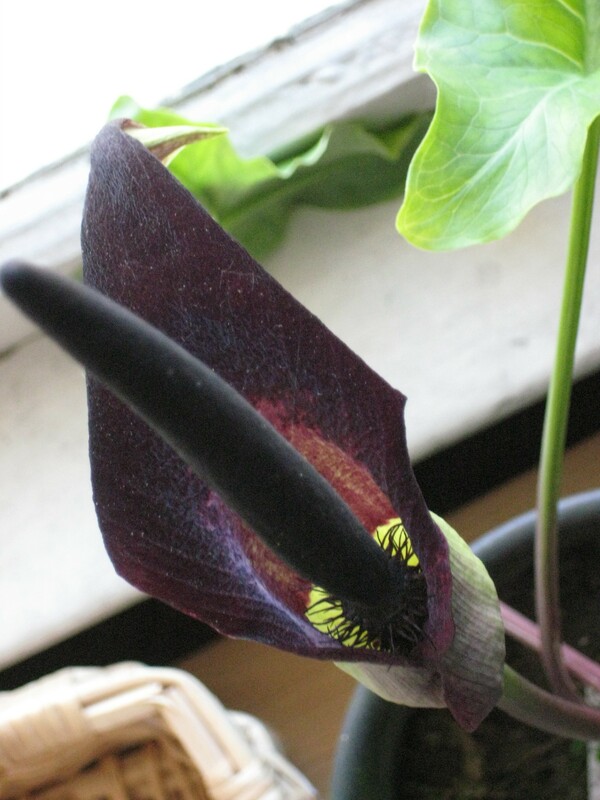 Usually it has a greenish exterior that unfurl to reveal a the deep maroon color of the flower with an intensely black spike (spadix) thrusting out of the middle. with a tapered tip that dangles behind it like a tail. In milder climates, like the one I live in, this plant can can be grown outdoors. Like its distant cousin the white calla, it thrives in sandy soil and can be planted in the shade to partial shade. In climates with a colder snap in the winter it is better suited to be a hot-house or houseplant. But be cautious. Like many of its morbid cousins, there is a faint fetid odor that is emitted when this plant is in full bloom. This is thought to attract its pollinators, usually flies and gnats. Light shade, regular water, mildly acidic soil. Quite likes neglect. You can keep it in a pot for a long time, just remember that it dies back completely and loves the rain, so mark the pot well and set it out somewhere it will absorb rain for the winter. Don’t let the “empty” pot fool you! Mine produced only leaves for several years and then bammo! One year in mid-April it bloomed in all its glory. My Black Calla in bloom! Like Rotten Botany on Facebook!